LIVINGSTON COUNTY — It’s all hands on deck for National Grid as the region braces for a potential ice storm. According to a press release from National Grid they have more than 2,000 line, service and tree workers on alert. Crews are being deployed across upstate as needed as they target areas where the most damage is anticipated. Call 1-800867-5222 to report downed lines. According to the National Weather Service the forecast for the next 3 days has the potential to cause a tremendous amount of damage. Freezing rain, mainly after 8pm. Low around 30. Northeast wind 13 to 16 mph, with gusts as high as 26 mph. Chance of precipitation is 100%. 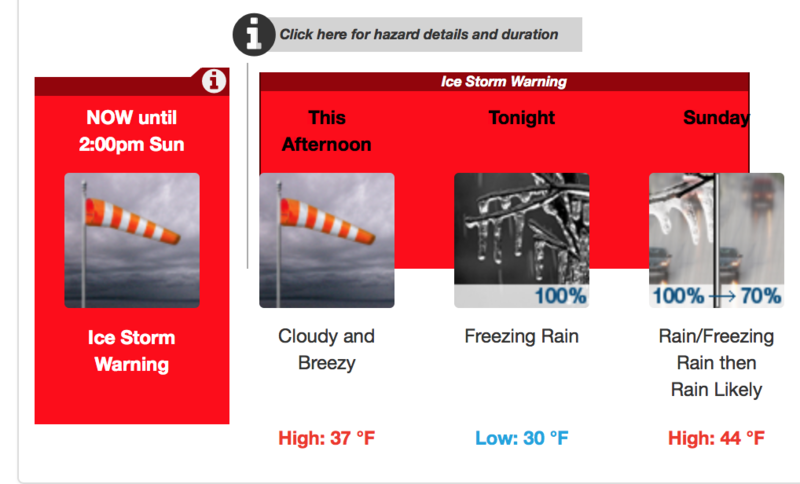 Freezing rain before 10am, then rain. High near 44. Northeast wind 10 to 15 mph. Chance of precipitation is 100%. New precipitation amounts between a tenth and quarter of an inch possible. Rain, with thunderstorms also possible after 2am. Low around 44. Southeast wind 13 to 17 mph, with gusts as high as 39 mph. Chance of precipitation is 100%. New rainfall amounts between three quarters and one inch possible. Rain and possibly a thunderstorm. High near 44. South wind 7 to 11 mph becoming west in the afternoon. Chance of precipitation is 100%. New precipitation amounts between three quarters and one inch possible. In preparation for strong winds, freezing rain and ice accumulation across much of upstate New York over the next 24 hours, National Grid has more than 2,000 line, service and tree workers on alert, including additional support from the company’s New England workforce and from neighboring New York utilities. Crews are being deployed across upstate as needed, particularly in areas where the weather is expected to be the most severe. We urge customers to be prepared and remain safe. Remember to never touch downed power lines; always assume they are carrying live electricity. Downed lines should be immediately reported to National Grid at 1-800-867-5222 or by calling 911. Keep a number of working flashlights, at least one battery-operated radio and an extra supply of batteries in your home. Also, make sure to keep your mobile devices charged prior to an event..
Use your mobile device to track outage information, report outages and storm-related safety tips through National Grid’s mobile site accessible at www.ngrid.com/mobile(m.nationalgrid.com). Other ways to stay in touch: Follow us on Twitter or Facebook and Instagram; we post all the latest storm and restoration updates.